CHINA may not like this play. Not only is it about the touchy subject of Tibet, it opened within 24 hours of activists being convicted for pro-democracy protests in Hong Kong, another territory with a vocal opposition to Chinese rule. It is 2008, when the population of Tibet’s capital Lhasa rioted. 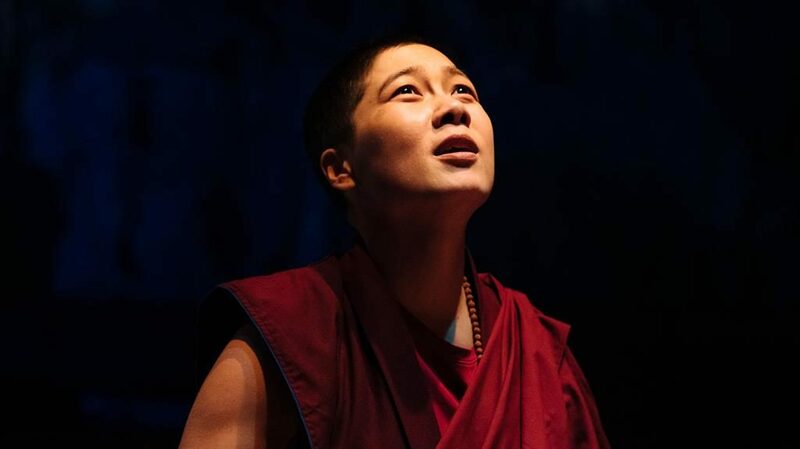 In Abhishek Majumdar’s fictionalised version, developed in conjunction with Tibetans in exile, the violence is sparked by a protest made by Deshar (Millicent Wong), a student Buddhist nun who sets herself alight. The moment is also the trigger for a stunning coup by designer Lily Arnold, which sees the rust-red structure that dominates the Court’s tiny upstairs theatre emit great jets of fire that seem destined to engulf us all. In Debbie Hannan’s potent production, Chinese power is embodied by Deng (Daniel York Loh), the Beijing-installed policeman charged with ‘re-educating’ Tibetans who resist the idea that their identity is Chinese. Wong’s Deshar is a portrait of poised defiance. She gets decent support from Richard Rees as her father, an embittered guardian of Tibetan culture. Yet although Bangalore-based playwright Majumdar pulls no punches in the way Chinese power is harrowingly used, there is care to show both sides as victims. The play is a fair-minded sermon about how to break the cycle of violence.